This article explains how to make cream cheese from goat milk cream. Making cream cheese is very similar to making quark cheese. The principle difference is that homemade cream cheese uses a very small amount of rennet to produce a stiffer consistency than that of quark. The recipe below is a full-fat version for making cream cheese that uses only the cream of the milk. If you prefer a lighter version, you can substitute part of the cream with milk. I don't personally recommend using less than half cream, though, to get the best flavor and texture for homemade cream cheese. The small amount of rennet used to make cream cheese is what gives it the additional firmness over other soft cheeses such as quark or cottage cheese. Be sure to always add liquid rennet to a few tablespoons of water first--never directly to the milk. Pour the cream into a cheese-cloth-lined colander placed over a bowl to catch the whey. Let drain for about 12 hours. At that time, you can collect the cream cheese from the cheesecloth and place into a bowl for storage in the refrigerator. Mix in herbs or seasonings, if desired. If you'd like a drier, molded cheese, you can place the cream cheese into a cheese mold (or a small plastic container with holes drilled in the bottom) to further drain and increase the body of the cheese. 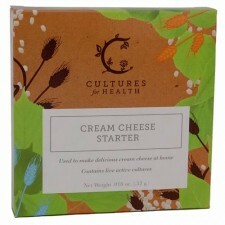 An alternative to using buttermilk is to use a direct set culture, like this cream cheese starter from Cultures for Health. You can also find rennet, cheesecloth and all your other cheesemaking supplies there, and shipping is a low flat rate of $3.99 for the continental U.S.! Articles are updated frequently, so check back here for any new information for how to make cream cheese!